Oakland’s patented Film Thickness Gauges set the industry benchmark for innovation. Advanced MicroGauges, Tensile Testers, and Elmendorf Tear Testers for the discriminating lab. Higher quality film, paper, and sheet converts faster, with less machine downtime. Inspect yours. We are a full-line manufacturer of test instruments for your plastic film extrusion lab (blown and cast films), paper manufacturing lab, converter film & sheet lab, flexible packaging manufacturing lab, and your resin production lab. Known for our innovative designs, solid applications support, and value-based pricing, let Oakland Instrument help you solve your toughest quality control problems. Formed in 1995 with the introduction of computerized benchtop thickness gauging products for the plastic film extrusion industry, Oakland has grown to become the leading web & sheet test instrument company specializing in computerized instruments in the thickness / caliper, tensile test, force measurement, and coefficient of friction product areas; Simultaneously, Oakland expanded its product offerings to become the only full-line manufacturer of test instruments for the blown and cast film extrusion industries. Oakland now compliments its integrated design-build approach by recently expanding its 500 ft2 in-house lab at our factory. With the purpose of assisting customers with sample runs, product demonstrations, and customer training, this lab capability will allow us to continue to address the most pressing needs of our valued customer base. Feel free to call us with your questions - whether you work with us over the internet, over the telephone, in person at your plant, or visit us at our modern manufacturing facility, we are committed to providing you with great customer service. All labs are created equal. Some are just better equipped. Let Oakland Instrument equip yours. Advanced MicroGauges, Tensile Testers, and Sample Cutters for the discriminating lab. Non-wovens, wovens, serving the textile industry with Tear Testers, Impact Testers, Cutters. 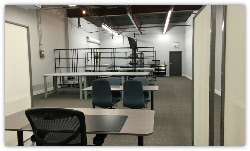 To further compliment its integrated design-build approach, Oakland opened a new research and product development center in December 2017. With the purpose of advancing its product offerings, this 2200 ft2 center will allow us to continue to address the most pressing needs of our valued customer base. Feel free to visit us at our modern manufacturing facility for a tour of our new R&D Center. Oakland’s new Research & Development Center.